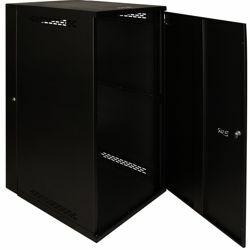 Wall Mount Enclosure Cabinet 26RMS | Avcomm Solutions, Inc.
ICC’s new wall mount enclosure cabinets are ideal for both secure and non-secure installations, and are available in 12 and 26 rack mount spaces (RMS). 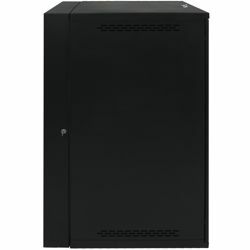 These enclosures are designed to hold 19” rack mountable equipment and are compliant with the EIA/ECA-310-E (revision EIA-310-D) standard. 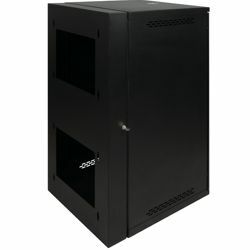 The depth for each enclosure consist of 24” from front to back includes top, bottom knockouts for cable entry and exit, with vented top and bottom side panels for maximum air circulations. 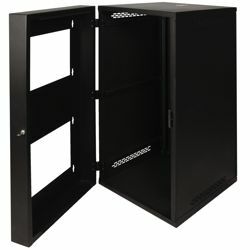 These wall mount enclosure cabinets come with adjustable internal vertical mounting rails for depth management. For added security the door is lockable and can be installed to be removable /reversible with dual hinge swing unit that provides quick access to rear of equipment. Both enclosures come fully assembled for quick installation. •Required (8) 1/4-10 x 2 Hex lag screws to secure into the wood studs. Not Included.